Today is cookie baking day! And Ella and Elfina got to help put it all together.... Ella did really well cracking the eggs all by herself and using the hand mixer for the first time (that made me a little nervous, as I pictured everything flying all over the kitchen). We were also excited that Mim showed up unexpectedly and we could start sharing the cookies that we made. Today is a helpful Elf day.... today is all about helping out the people you love.... so why not start with Mom and Dad.... Ella's job today (with the "help" of Elfina) is to do three jobs around the house to be helpful.... she was also encouraged to help her Mim today but she slept in so she didn't get to find the Elf before going to Mim's house this morning. Though this day didn't go exactly as planned.... Ella was helpful and did so some things to help around the house... and she even helped our neighbor put salt on his driveway. I also didn't get any pictures. Today's Advent Adventure involved singing at a fundraising Coffee House. 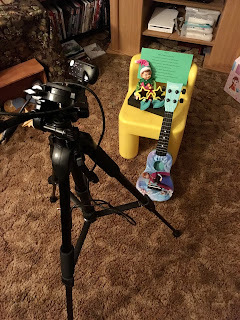 Though it didn't go exactly as I would have planned.... it was pure Ella fashion.... we didn't get to have Elfina on the stage but she enjoyed the show. Today we are hunchering down and staying in for the morning.... yucky wintry mix outside makes the idea of staying inside all the more exciting. So today is Gingerbread house making day!!! Today's verse talks about building on a firm foundation - the rock! Jesus Christ! I thought that was fitting for our gingerbread making. Let’s get out the candy, please don’t eat it instead. If you find me, please put me inside my book shelf. So let’s start from the bottom, and when finished give a cheer. It's book day... we have lots of Christmas books so today we built a house for the elf out of books and will take some time throughout today reading some of our Christmas books. PS - my great husband went to the car this morning and got the elf once Ella realized that she had left it in there. This was Ella's entrepreneur day.... in the summer and fall - Ella has a Veggie stand so she decided she wanted to make pretzels to give as gifts and sell at Cruisers. She enjoyed our pretzel making event. You can make chocolate covered pretzels that will be the bomb! Is good for the heart, and that is a fact. Today was mommy/daughter day. We spent the day together, shopping not only for the gifts that I needed but also for Ella to learn the importance of giving. So she was given money to get something for a friend as well as herself. I even have this gift card, for you to pay. Also buy a gift for a friend and share your wealth. Since this was Joel's week off and our Anniversary we were on the road a little more than usual. We left on Monday and headed to Lancaster for an overnight. We knew it would be dark on our trip so looking for lights would be a fun highlight of our trip. I love that song, and I love lights! This house had music with it. Day 13 - was a fun day for all of us.... as we celebrated out 8th Anniversary as a family by going to see Samson at Sight and Sound. It was a bonus as well that we got tickets for half price. Ella was so excited and did a great job! She really wants to meet Samson but she was sad that he is dead... then she said, well I guess I will have to meet him in heaven. These two days were spent in DuBois Pa. We spent some time at a hotel (thanks to Mandy!) And enjoyed meeting new family as well as time celebrated Christmas with some family members. Ella had a sleepover at Nana's house and enjoyed Cousin day with Easton. I didn't get lots of pictures, but here is an Elf picture of the set up - they enjoyed lots of fun activities together. So open me up, and together enjoy! Day 11 - thankfully - the weather did work out as it was predicted because I had to plan everything ahead of time for the whole weekend... and it snowed as planned and Ella loved it! Will it be snowing, can you see it with your eyes? This was also a great opportunity to talk about the fact that Jesus washes our sins are white as snow! What a great promise! Making Snowmen as we drive home. Sorry I haven't been great about the blogging lately.... we were away and I have been tired in the evening. I will try to do two days at a time to catch up on my blogs. On Day 8 - It was Daddy Daughter Day and one thing that Ella loves to do is be creative and make up songs and make videos. She is very random as you will see. But I think you will enjoy her video of the day. Today we will make some videos of the things we have done. Day 9 - Was all about giving to others. Ella loves stuffed animals and dolls and she finds it challenging to buy them and give them away when she really wants to keep them.... however this year we only got a few minutes of you can't keep it, which was an improvement from last year... which was a lot of tears! Anyway - cool story - we weren't able to find a donation bin the day we got the gifts so we saw one at our hotel... and little did we know but we also earned some free hotel points for donating the gifts. So proud of her for not crying this year when I told her she couldn't keep it. To help out a friend of mine. But Kit wasn’t around so let’s make one my dear. In addition to making the stocking for Kit - we also spent some time talking about what it means to be God's creation and his workmanship. It was a fun day of crafting together.